Boys Dress Up: Girls Don't Own Dress Up Play! How It Can Be Awesome For Boys Too! Boys Dress Up – Because Role Play Fun Isn’t Just For Girls! Little boys usually love dressing up just as much as little girls do! There are just as many options out there too… they just don’t look as “pink or frilly”. 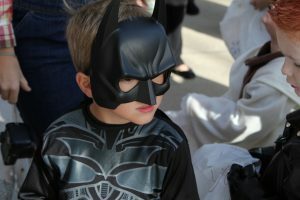 Here are a few of the different costume themes you as a parent or friend can explore in order to encourage your little man to have some fun stretching his imagination with dress up. He can be a fire chief. A doctor or nurse, or a vet (popular in my house… all of our stuffed animals get pretty ill here rather often 😉 ). An airplane pilot. A construction worker. A chef. A farmer or cowboy. A priest or minister. A dentist or surgeon. The possibilities are endless! So are the benefits. 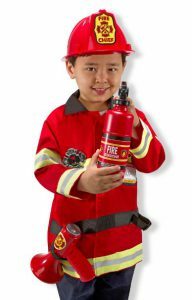 Other than job awareness, playing “when I grow up” or dressing up in “career outfits” also encourages the building of vocabulary, enhances problem solving, and builds the skills of cooperation as they imagine scenes working alongside the other children on the job scene. It seems like everywhere you look these days you see brand name stuff. A quick walk through your local Walmart makes it seem like your child really IS different if he doesn’t have everything in his room (life) covered with Minion or Batman or Paw-Patrol or whoever is the favorite character of the moment. So it is NO surprise, is it, that brand Superhero character costumes are popular ones for these little guys of ours. Superman, Batman, Spiderman, The Hulk… they are cool. And they are well known. Because, like I said, they are EVERYWHERE. The superhero costumes are also great because well, which boy doesn’t want to wear a cape? And “fly” through the air or climb walls? Let’s be honest… when boys dress up as superheroes, they go a little bit crazy, don’t they? And they have a BLAST. Some parents don’t really encourage the Superhero costumes for their little guys, just like some parents don’t want their little girls inundated with Princess everything. 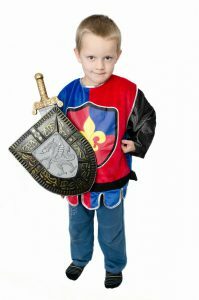 But the area of dress up as Knights and Kings can be a fun, manly type of dress up they DO want to encourage! A boy dressed up as a knight or a king has a certain type of behavior to take on, you see? One that is kind, respectful, serious, good, and generous. 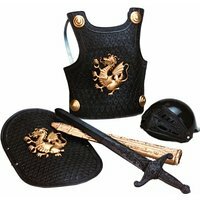 One of the reasons little boys LOVE dressing up as Knights, Soldiers, Kings, Dukes, and Princess, is that costumes come with some fantastic armour! Find me a little boy who doesn’t want to have a fancy fake sword buckled around his waist, or a lance to wield, and I’ll be rather shocked. And the fancy costumes they get to wear as Sir Kevin the Magnificent or King David the Wise, or Prince Aidan the Brave? They feel pretty important so nicely decked out! There are few little boys who don’t love to pretend they are lions or tigers. And your little boy probably does a great monkey impression, doesn’t he? Animal costumes are another great costume theme that little boys love. Animal costumes can be as simple as a hat or a mask, or as warm and cuddly as a full animal zip-up costume. They can be a tail tied around the waist or a furry pair of bear feet. 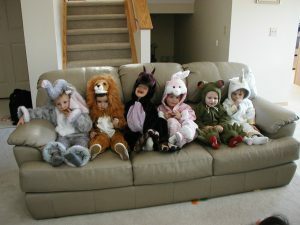 The variety is astounding too… and there are possibilities for costumes for almost any animal your child can think of! Little boys dress up is a lot of fun. They play hard, they laugh hard, and their wonderful imaginations never stop running. What does the little boy in YOUR life like best? Which theme is most popular for him… or have I missed one? 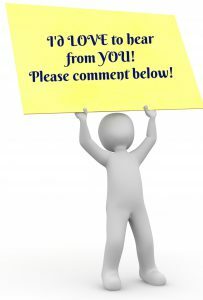 Let me know in the comments below… and feel free to send a picture of your little guy deep in play! Little Girls Dress Up Clothes Trunk – Is Cute Or Practical The Better Choice? I have two girls, ages 2 & 3, and they absolutely love dressing up. For the older one’s birthday in a few weeks we are going to have a princess and prince party. Hopefully the boys won’t be disgruntled at having to be princes. My daughter’s best friend, Thomas, insists that he is going to wear his spider-man costume so at least he will be happy. And having Spider-man in attendance will be just hilarious in photos! Especially looking back years from now! Might want to make sure Thomas’ mom somehow gets a pic of Spider-man surrounded by his royal friends LOL! Have fun, and thanks for the reply. I don’t think you’ve missed anything in terms of cosplay theme. Well done and thanks for sharing! I can’t go ANYWHERE without my little guy pointed out firetrucks, police cars, and ambulances on the road! 🙂 Very much loved themes for dress up, absolutely! Thanks Maya, and congrats on your baby girl! You’re in for some wonderful years of imagination and fun! 🙂 I’m glad you enjoyed this site! Thanks for dropping by, and have a lovely day! Indeed, boys dress up too, they just don’t dress as princesses (I don’t think they even dress up as princes, lol). This is because they want to be superheroes and saviors of the world. I don’t get why (’cause all my siblings and similar age cousins are females) boys love such violent games for dress up. When we were younger and we weren’t asked to play certain games (or not to play certain games) we always played peaceful ones such as cooking, tea parties, or fun adventures (never fighting ones). However, I’ve seen little boys make-believe play turn into real fights……looks like I can never understand them, lol! Thanks for dropping in! Have a lovely day. I am having so much fun reading your post. Me and my nephews usually play heroes and villains but I never thought of playing with a full costume though but I playing with a full set of costume will take it to the next level! Thinking about how our play time would be excites me on how it will turn out! thank you for this Marlaine. So I came up on you site. It’s very happy looking. So I stop and look around. When reading I was thinking, about when I was little. My mom would tell me to stop changing my clothes. Always dressings up. Those pictures are great. You got great content on this site. I’m going to recommend friends to come to this site. Thanks Michael. It’s great to have validation of the point of this article… that dress up play is NOT just for girls! I’m sure you as a little boy had a great imagination, playing dress up and more. I appreciate the comment, and glad you dropped by!